LONDON--(BUSINESS WIRE)--Quantzig, a global analytics solutions provider, has announced the completion of their latest article on the new food trends that will change the food industry in 2018. Trends in the food industry keep changing every year. We have been observing a change in trends this year, which is a reflection of the change in attitudes towards the environment, community, and most significantly health. Healthy food trends are now becoming popular and the menu cards of many restaurants have healthy food options. From avocado craze and brunch boom to burrito bowls (also called as Buddha bowls), we have examined all of the new food trends for this year. These healthy food trends have now become more popular than before. 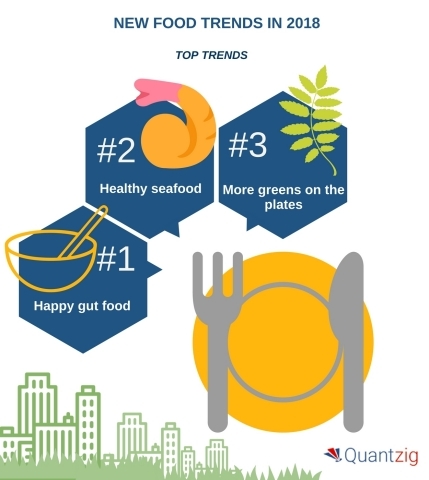 So, in this blog, Quantzig has listed some of the best food trends in 2018. Request a proposal to know more about our web analytics solutions. Happy gut food: Do you know that a new microbiota can be cultured in the body in 24 hours by altering food habits? Yes, our diet impacts the microbes present in our body. Consequently, to keep the gut bugs healthy, following healthy food trends is a good idea year. Gut-friendly food like kimchi, miso, and kefir are quite popular and are going to see more innovations in the days to come. Request a demo to know more about our portfolio of analytics solutions. Healthy seafood: Seafood and health are interrelated in many ways. Seafood is going to be a widespread choice for many in breakfast and brunch dishes. Since it’s going to be one of the healthy food trends in 2018, many restaurants have started adding new varieties of fish and shellfish to offer the variety that consumers may not be as familiar with in dishes like fish tacos and ceviche. Get in touch to know more about the best food trends in 2018. More greens on the plates: This is one of the new food trends to let you fall for vegetables. Chefs at restaurants continue to find creative ways to serve vegetables to their menu’s center stage. Here falls the very popular risotto bowl from Hampton and Hudson in Atlanta that contains pumpkin seeds, roasted sweet potatoes, Brussels sprouts, smoky parsnip risotto and fried kale. It is one of the new food trends that is going to become even more widespread in the days to come. Visit our page, to view a comprehensive list of the best food trends in 2018. Quantzig is a pure-play analytics advisory firm concentrated on leveraging analytics for prudent decision making and offering solutions to clients across several industrial sectors. Request a proposal to see how Quantzig’s solutions can help you. Quantzig is a global analytics and advisory firm with offices in the US, UK, Canada, China, and India. For more than 15 years, we have assisted our clients across the globe with end-to-end data modeling capabilities to leverage analytics for prudent decision making. Today, our firm consists of 120+ clients, including 45 Fortune 500 companies. For more information on all of Quantzig’s services and the solutions they have provided to Fortune 500 clients across all industries, please contact us. Healthy food trends are now gaining popularity and the menu cards of many restaurants and food courts have healthy food options.